While Khao San Road is a stay away area if you want quality food, the area around the famous party street has something to offer for empty stomachs. 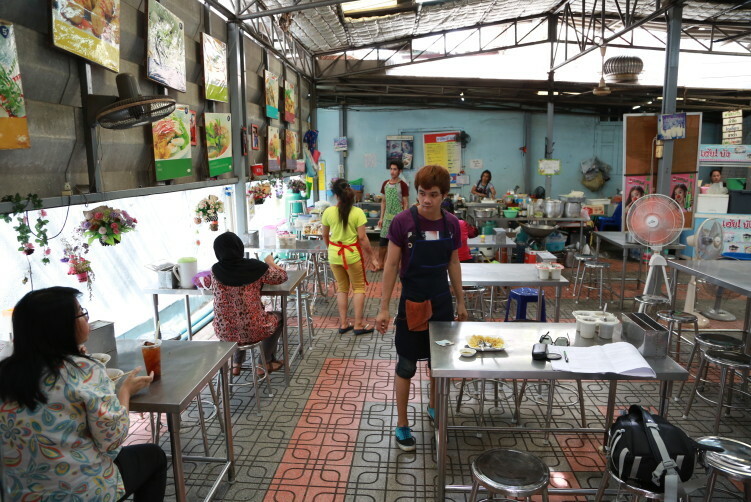 The food court-style Aisa Rot Dee is one of the places to check out, a good place for Thai-Muslim food. Unpretentious and yummy flavors. 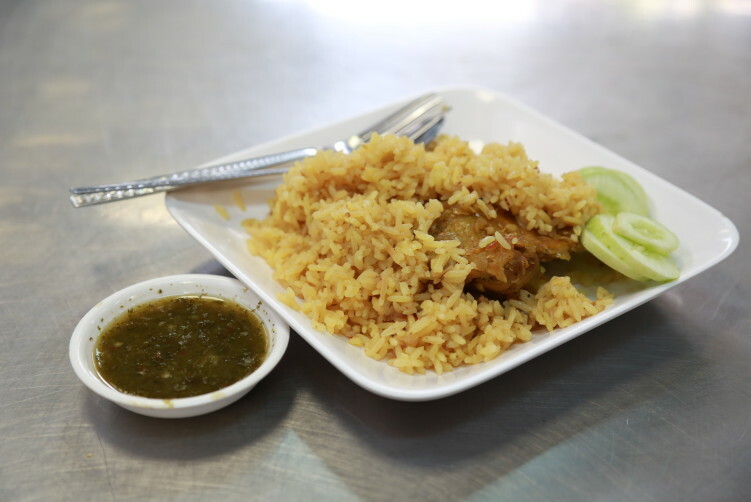 Khao Mok gai/neua (chicken or beef biryani) and beef satay are many regulars first choice. Aisa Rot Dee is a longstanding establishment with some decades on their back. 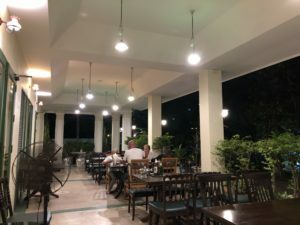 Situated in the Banglamphu neighborhood, just a few minutes walk from the famous backpacker area, it benefits from both locals as the more exploring lifestyle people seeing the area as a test bed for different personal choices. Aisa Rot Dee is more like a food court-style venue with a number of stalls in a small open-air courtyard. In other words also a great stop for introduction to Thai-Muslim food in general, of course if you can find it. It’s not as easy as you think, especially as the red plate with the name on is only in Thai. They serve a mix of southern Thai ingredients and flavors historically brought here by traders from the Middle East. The different dishes are pictured on the wall so it’s easy to choose your food. Pork ball skewers with a sweet and “spicy” sauce, beef satay with yellow curry powder, biryani and mataba are some of the dishes. The mataba is served with a sweet sauce that includes slices of ginger instead of the usual cucumbers, that you see at Roti Mataba close by and opposite the Sumen fort. My personal preference when here is the biryani, which also is their most known dish. It’s not the best in town, but it’s very good. The barbecued chicken drumstick is fall of the bones and juicy at the same time. 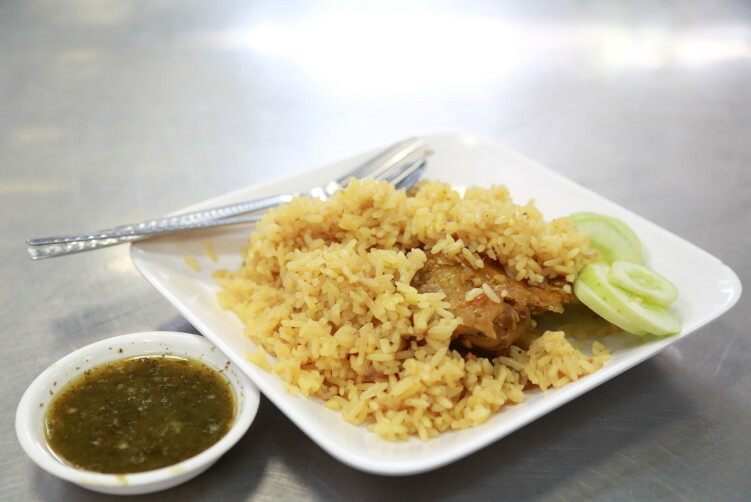 The fragrant and excellent cooked yellow rice is seasoned with turmeric, cumin and chicken stock. You can also have it with braised beef in a wonderful sauce if that is your preference. The beef version is not an easy find in Bangkok. On the side you will have a green vinegar- and herb-based sauce with a sourness that fits the food. The beef satay is both sweet and salty and is of course soaked in coconut milk. They also have a curry noodle soup (kuay-tiao gaeng), meaning rice noodles in a rich but mild curry broth with coconut milk. Cardamom, ground peanuts, tofu strips and a hard-boiled egg are some of the ingredients. And don’t let me forget the cilantro as a garnish. Personally I prefer the sen lek noodles. For the beef noodles, star anise is definitively part of the recipe that includes some lovely pieces of oxtail. 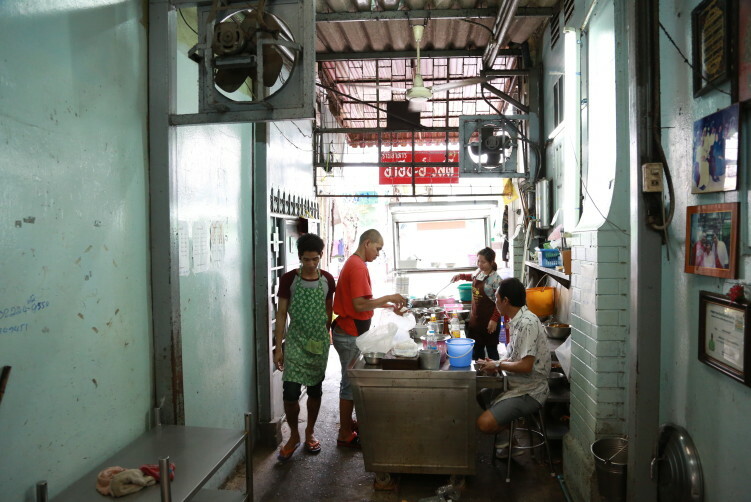 The beef noodle stand is in the small and narrow alley you will have to pass to get into the courtyard. In general, you definitively don’t go wrong by eating here. It’s also rather cheap. To find it is another story. If you’re not tipped off by a guide (book or internet) or by a nice soul out there, you’re not likely to hit it, even if it really is close to the backpacker central Khao San Road. The level of english is limited, so the photos on the wall comes quite handy unless you speak Thai. http://rainypass.com/faq/ Food: Muslim food. Excellent biryani. How to get there: Taxi is the easiest way coming from down town Bangkok. It’s a 6-7 minutes walk Fort Sumen. 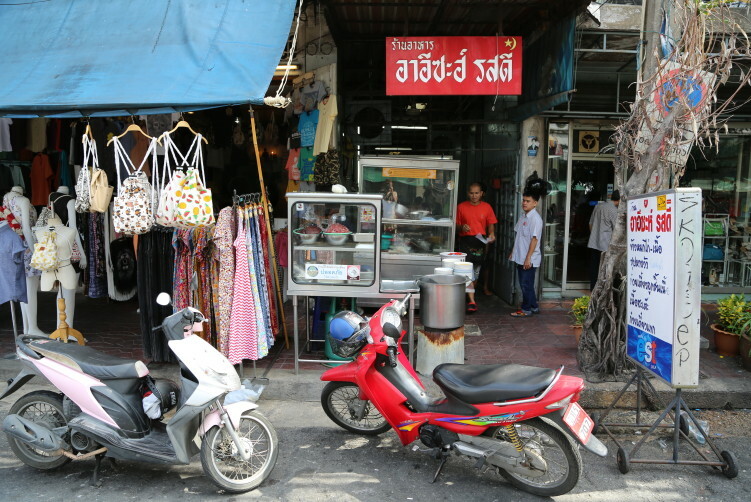 If you walk along Phra Sumen road, away from the fort, you take the third road to your left, down Chakrabongse road, then the second to your left and you find yourself in Tani (Tanee) Road. Walk down towards the roundabout. You find the red sign with white letters and the yellow star symbol above the small alley to you right, about 40 meters from Rambuttri Alley. Head for the small alley and the courtyard opens up in front of you. 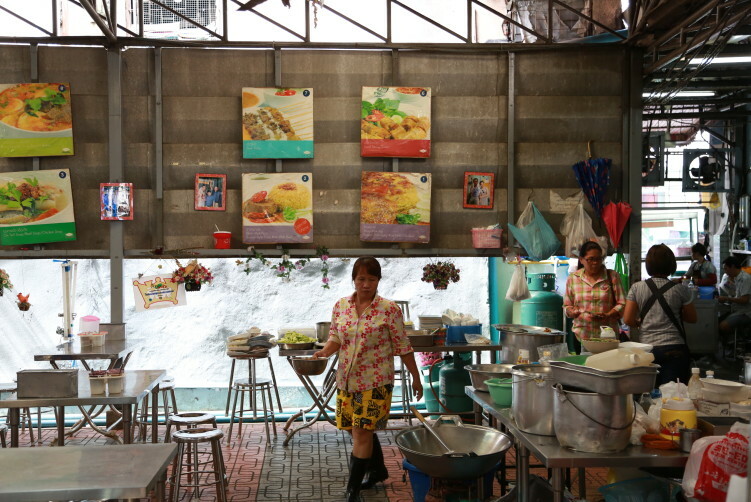 The food court-style Aisa Rot Dee is a vendor to check out for Thai-Muslim food. Unpretentious and yummy flavors. Khao Mok gai/neua (chicken or beef biryani) and beef satay are many regulars first choice. See full review at StreetsideBangkok.